For open conversations about intimate partner relationships. What is abusive behaviour in an intimate partner relationship? What are the markers of a respectful relationship? Respect or disrespect are revealed in how we talk to each other, how we touch each other, how we make decisions, how we share power. They are revealed in our attitudes to gender, sexuality, finances, friends, family, children, roles and culture. Drawing on research and extensive practice in family violence, No Room for Family Violenceis a set of 30 cards for having conversations with young people or adults about what abusive and respectful behaviour looks like in intimate partner relationships. 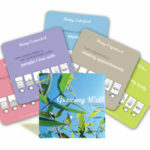 This card set explores 10 key aspects of a relationship in which abusive or respectful behaviour can be recognised by asking three simple, clarifying questions:What do I want MORE of? What CONCERNS me? What do I want NONE of? 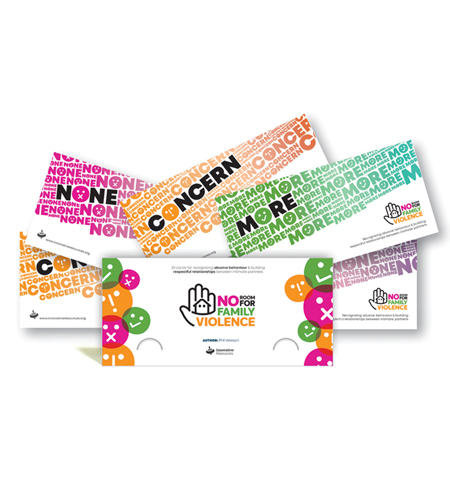 Use these cards to create dynamic, open conversations about intimate partner relationships in schools, sporting clubs, family violence services, refuges and community services, counselling, health education and mental health settings, groups for men, women, couples and parents. Make sure conversations about abusive and respectful behaviour are on the agenda wherever young people or adults gather—this is one powerful way to raise awareness about intimate partner violence and help bring about change. Family violence is a serious yet often hidden crime. It is a fundamental violation of human rights and is unacceptable in any form, any community, or any culture. Led by the efforts of specialist services and people, primarily women, speaking out courageously about their experiences, family violence seems to be finally emerging from the shadows as the general public begin to have conversations more widely about it. People are beginning to be more aware of the drivers, patterns and devastating effects. We are learning about the underlying power dynamics and attitudes, particularly towards women, that give rise to it. In its publication called Family Violence Risk Assessment and Risk Management Framework and Practice Guides(2012) the Victorian Government Department of Human Services defines family violence as ‘ … behaviour that controls or dominates a family member and causes them to fear for their own or another person’s safety or wellbeing. The publication goes on to say, ‘Family violence extends beyond physical and sexual violence and often involves emotional or psychological abuse and economic abuse. 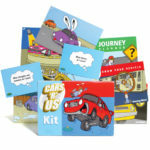 The new card set published by St Luke’s Innovative Resources called No Room for Family Violence reflects these drivers of family violence. It sets out to create conversations where everyone, regardless of gender or sexual identity can recognise abusive and respectful behaviour in an intimate partner relationship, and get closer to articulating what they want more of, what they are concerned about and what they want none of. MORE, CONCERN and NONE—these are the three suits in this card set. Use these 30 cards to create dynamic, open conversations about intimate partner relationships in schools, sporting clubs, family violence services, refuges and community services, counselling, health education and mental health settings, groups for men, women, couples and parents.